Every reviewer has come out and told you that Barrage is a heavy game. It isn’t—not exactly. Mechanically, Barrage is incredibly simple. I’ve taught the game successfully in under 10 minutes. A lot of this is due to the excellent integration of theme and mechanics. It creates a lot of intuitive gameplay and helps tremendously with the rules explanation. There aren’t many new mechanics in Barrage that gamers haven’t already seen before. Technology allowing you to upgrade your previous actions is nothing new. Worker placement has been around well over a decade. The equipment/resource wheel is very reminiscent of Tzolk’in. Buying and fulfilling contracts is nothing new. Construction buildings is nothing new. Placing workers to acquire money is nothing new. Specific round objectives to score points is nothing new. A lot of this, we have seen before. The individual mechanics of Barrage are tried and true mechanics that gamers should find as comfortable as slipping into a warm bath. This isn’t a bad thing—far from it. Gamers will need this familiarity and hand holding for what lies ahead. Mechanically, Barrage is intuitive and easy to learn. Strategically, Barrage is beast. It is quite literally a barrage of water of such strategic depth where casual gamers might drown but heavy board gamers will rise and thrive. The individual mechanics are quite simple, but how they interact and build off each other takes experience to master. This is Barrage’s greatest strength. Is there really any confusion about how much water is released and at what round? Love the art decor design on all of the components! Most heavy games take a learning game or two just to get the mechanics down and see how they interact before allowing players to play a game while solely focusing on the strategy. Barrage, with its ease of play, leaps over this allowing gamers to immediately dive straight into the strategy. To fully drive this point home, I taught myself how to play this game without seeing any of the video reviews or playing the demo. All I had was a box of unlabeled components and a rulebook with only text—no pictures. I had no idea what piece was what; however, the rules were so clear and simple, I could intuitively understand how the game should be played. And I did all of this sick in bed with a sore throat, a headache, and a fever. This not only makes Barrage ideal for heavy gamers, but also ideal for experienced casual gamers looking to try something heavier. Barrage combines familiar mechanics into an innovative and interactive design with a fresh theme that instantly makes it worthy of shelf space. I understand that the art and graphic design aren’t finalized and are subject to change; however, Cranio Creations is adamant about a quick 6-month fulfillment wait period. (That’s awesome by the way.) Therefore, I’ll assume most of the graphic design is finalized and subject to a preliminary critique. Minor Concern 1: I’m not 100% comfortable with the exclamation mark “!” being used for the income phase. I have been programmed by the gaming industry for decades to associate “!” with game effects that trigger immediately. Players get the !!!!! immediately and for income. Not the biggest deal, just a little strange. Minor Concern 2: The rulebook (while only in its first rough draft) is missing upkeep. Nowhere in the rules does it mention to gather all the engineers placed in a round or how to reset the contract office board. We all assumed it would be during the beginning of the income phase or the end of the scoring phase. We assumed that since all unpurchased advanced tech tiles are discarded, then all unpurchased contract tiles are discarded as well; otherwise, why have 15 of each? Score 8 VP, and gain another 8 energy but you can’t use that energy to fulfill contracts. Minor Concern 3: There were a few timing issues that need to be worked out and mentioned in the rulebook as well. For example, we assumed that the production action time table worked as follows: (1) water moved to powerhouse, (2) energy calculated from main board, player board, and turbine board, (3) energy added to the energy track, (4) contract fulfillment, (5) recovered energy & bonus energy from contracts or tech calculated and added to the energy track, and finally (6) water leaves the powerhouse and continues to flow naturally. This is a subtle distinction, but an important one that does affect scoring—especially late game scoring. Minor Concern 4: While I completely disagree with this, some of the gamers from our group mentioned the board was difficult to read. I pointed out that the water pipes are colored-coded for points: red pipes are 5 points, orange 4, yellow 3, green 2, and purple 1. There are also arrows on the board which show the direction of the flow of water. What does concern me is that the conduit production value icon is rather small and could be a tad bigger to increase readability and clarity—especially as it plays a major function in the game. Major Concern 1: The runaway leader. If the skill of the players aren’t equal, the better player will absolutely dominate the board. I have no problem with this. The negative scoring is quite punishing though and if players don’t collectively slow the leader down, it feels extremely difficult to catch up. Acquiring certain late game tech and having a weak 4th round to build up a strong 5th round are powerful strategies to catch up; however, they don’t feel quite strong enough. Also, the player who generates the most energy goes last in the following round. This does provide a catchup mechanic—especially in the late game where Turbine Actions are used before anything else to guarantee you score that water before your opponent does. I would need to explore this game more before making a final decision on the math. Not all the scores of all our games have been nail-bitingly close. With so few turbine actions available each round, it’s hard to imagine at least one player not getting negative points. Black numbers on a black board?!??! Not great. Is it like Power Grid or Brass? Power Grid has auctioning and bidding; Barrage does not. Brass (Birmingham and Lancashire) has multifunction cards; Barrage does not. Mechanically, they’re all very different games. (You see it coming, right?) However, if I had to compare Barrage to games I have played, I would easily say it gave me feelings reminiscent of Brass: Lancashire, Root, Ticket to Ride, 18xx, Tzolk’in, and Agricola. The Tzolk’in resource wheel returns—this time in the French Alps! The resources are never lost in Barrage, so “Time” becomes an intangible resource in the game that powers not only you turbines but every action you take. It also puts a noose around all your resources. All of them, money included, are incredibly tight. Misspending resources can definitely feel like being trapped in a hangman’s noose. One bad step, and you lose. 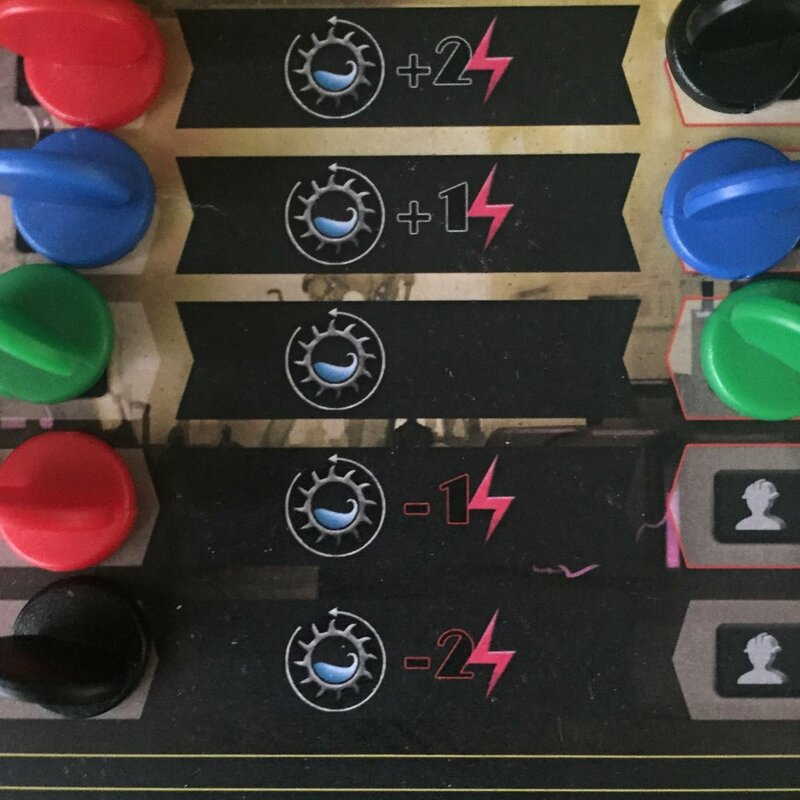 Brass and Root: Both of these games create a highly interactive environment where every action taken permanently alters the board and affects every player. Barrage is no different. In Barrage, like Brass, players need to constantly be thinking about the long game. Your plans will evolve though throughout the course of the game, not due to card draw, but due to where your opponents construct their facilities. You only have 5 dams, 5 conduits, and 4 powerhouses. Each one better be bringing in points, or you’re in trouble. Although I don’t play much Agricola these days, it is still one of the tightest worker placements out there, and really demands careful planning. Thankfully, you don’t have to feed your engineers in Barrage. Pork chop sandwiches for everyone! Orange 4, Green 2, and Luke Skywalker pilots Red 5! Spoiler Alert: I backed Barrage at the highest level. After only a few plays, I can honestly tell you I REALLY like Barrage. Reviewing Asian board games for the last few months (and being a long time player of Go), I have really grown to appreciate and thoroughly enjoy games that are easy to learn and hard to master. Welcome to Barrage. The familiar worker placement mechanics hold the players’ hands while they explore the deep underlining strategies of Barrage. You can teach your friends how to play the game in roughly 10 minutes. I have yet to accomplish this with Brass. Brass (both Birmingham and Lancashire) are fantastic games; however, the rules are riddled with “if this then that but not when this” rules and can leave new players scratching their heads throughout the first game. How about a game of Fizbin? Also, not once did we have to remind someone that their action was illegal—something that happens in every game of Brass (and Fizbin). You don’t even have to explain how the water flows in the game because everyone (flat earthers excluded) understands how gravity works. Intuitive iconography! Cost differences depending on whether you construct in the mountains, hills, or plains. 2 excavators times the conduit power marker equals the cost. For the most part, except for a few contracts and advanced tech tiles, the iconography is incredibly intuitive. You don’t need to be burdened by constantly referencing the rulebook throughout gameplay. The base game comes with two ways to play the game (with or without advanced tech). I could play Barrage without the advanced tech and be more than happy. The base game alone is a very solid and strong design. It didn’t need to come with the advanced tech, but having it there definitely adds a lot of replay value and longevity to the game. Even though the art and graphic design haven’t been finalized yet, it must be said that the game is beautiful. The gorgeous art deco inspired design used throughout the game really draws players into the theme. Your resource wheel is a TURBINE!!! Thank you Tommaso and Simone (and Nikola Tesla) for bringing a game with a unique theme. I’ve never understood why a significant percentage of board games every year are about trains, trading in the Mediterranean, the Middle Ages, or God forbid all three. There countless untold stories waiting to be explored by designers. Hydroelectric energy production may not have been on the top of my “want to see” theme list, but it sure is now! You’re glowing but is this game for me, Jay? (big inhale through nose) Maybe? Barrage is not for casual gamers. Don’t expect your in-laws to fall in love with you after introducing them to this game. Besides, you didn’t marry them, remember? Barrage is not a gateway game into the hobby; Barrage is a solid gateway game for experienced casual gamers looking to explore heavier games. This is due to the very easy ruleset and intuitive iconography. The main board is extremely readable and clear. It’s obvious what your opponents are doing, which makes it easier for you to stop them. I would feel comfortable recommending this game to experienced casual gamers looking to explore the heavier side of cardboard. Clear contract tiles for you to argue over! What you need to ask is if you enjoy unforgiving games. Well, do ya punk? Gameplay in Barrage is very competitive, but it isn’t mean or vindictive. I doubt anyone is going to throw furniture like in my one college game of Diplomacy. The runaway leader is something that I’m currently uncertain is generated from the game or from my local meta. Despite this, the gameplay is intriguing enough and captivating enough that I’m more than willing to back my copy and continuing exploring it. I wasn’t alone either. Everyone I played this with agreed they would be willing to play it again, even if they were in a humiliating last place (that was mostly me). I want to close with one last, but important, note. Barrage takes up a lot of table space. A lot. Thankfully the boards are separated, so you can rearrange them however works best for you. You tiny table owners though need to seriously ask yourselves when you are going to buy a properly sized table. After all, it is the best expansion. Gamer: Cardboard East recommends Barrage for gamers who love strategically heavy and highly-interactive economic games. Unlike most of these types of economic games, Barrage’s mechanics and graphic design are highly intuitive and very easy to learn—mostly due to the masterful integration of game play and its very unique theme. There were some minor graphic design choices I didn’t personally agree with, but it didn’t hinder the gaming experience. I am also aware there might be several tweaks from now until its release next year. Family: Cardboard East does not recommend Barrage for family game nights or for casual gamer night due to its heavy level of strategy. However, Barrage is incredibly easy to pick up and learn (but hard to master) and would be an excellent place to start exploring heavier economic games. Party: Cardboard East does not recommend Barrage for the party environment; however the game play is simple enough for gamers to enjoy a glass of their favorite booze (1920’s French jazz playing in the background is optional).